I realized something lately. The blog does not have nearly enough stir-fries considering how much I enjoy them. I view stir-fries as the easiest, tastiest way to use up whatever produce you have on hand. Just serve over quinoa or brown rice and you have a seriously hearty, vegetable-packed, nutritious meal. When I want something super hearty, I look no further than portobello mushrooms. Can I tell you a secret? 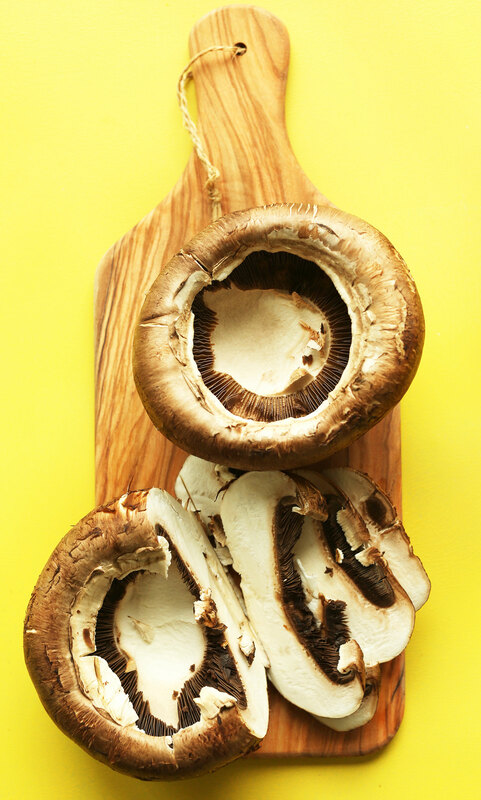 My absolute favorite portobello mushroom recipe at the moment is in our 31 Meals eCookbook (which has been recently updated to be entirely plant-based!). Think juicy portobello burgers with a creamy vegan garlic aioli sauce. It’s so good my eyes rolled back in my head when I took my first bite. Since then, my affection for portobellos has grown into full blown obsession. I had to put them in a stir-fry – there was no question. 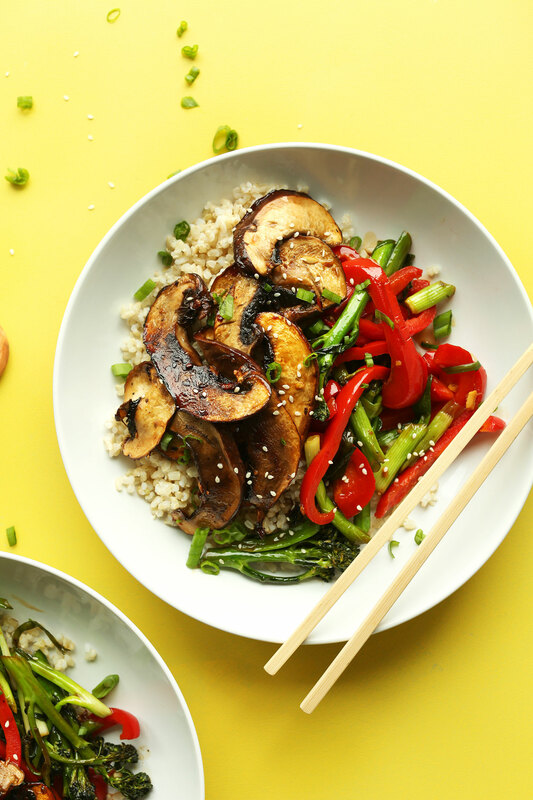 This stir fry requires 10 basic ingredients and comes together in about 30 minutes! The marinade is the perfect balance of savory, citrusy, and sweet. And the mushrooms soak it all up and get incredibly juicy and flavorful. Once your portobellos have had a few minutes to marinate, it’s onto the stovetop, where they get a sear on both sides and begin to slightly caramelize. Oh mama. For vegetables, I went with red bell pepper and broccolini. But I think you could use pretty much anything you have on hand! This is a very flexible, adaptable recipe that delivers big on flavor. 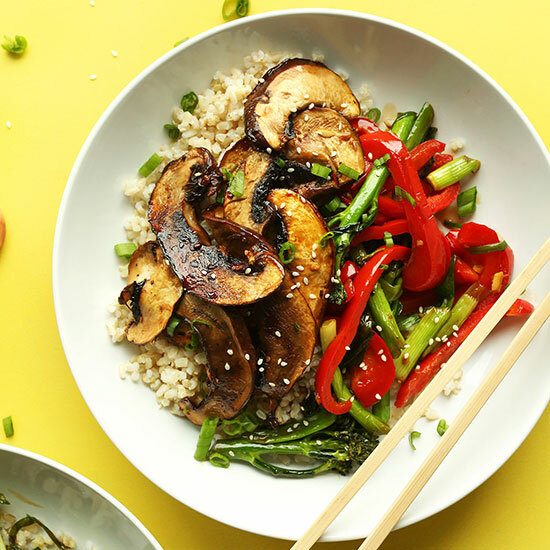 This would make the perfect plant-based meal when you’re craving something hearty but healthy. I think it would be especially great for hosting because just about everyone loves stir-fry and it’s so satisfying no one will realize they’re eating an entirely vegan/gluten-free meal. If you give this recipe a try, let us know! Leave a comment, rate it, and don’t forget to tag a picture #minimalistbaker on Instagram! We love seeing what you come up with. Cheers, friends! Cook rice (or cauliflower rice) if serving with stir-fry. I prefer this method from Saveur. Chop vegetables and set aside. 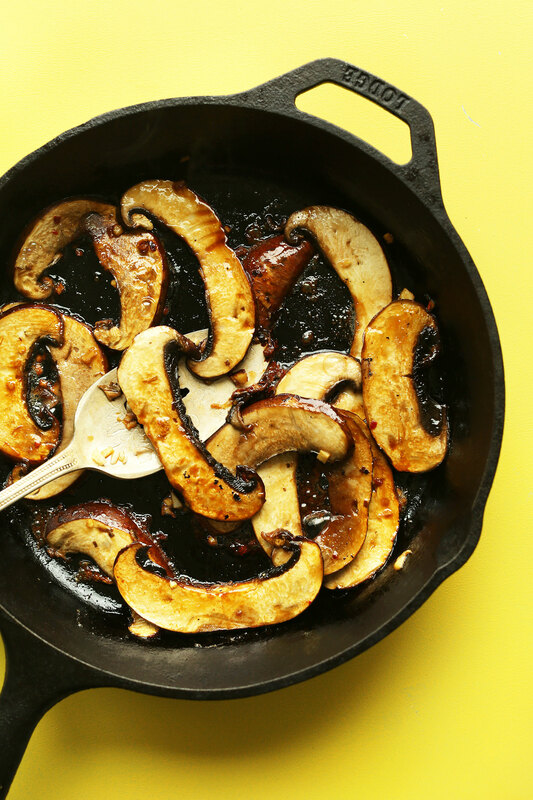 Once portobellos have marinated, heat a large skillet over medium heat and add a bit of sesame oil. Then add only as many portobellos as will fit comfortably in the pan (see photo), and sauté for 2-4 minutes on each side or until golden brown and slightly seared. You may have to do this in two batches depending on the size of your pan. *Nutrition information is a rough estimate calculated without additional toppings/sides. I made this tonight! Happened to have everything on hand. Delicious. Will make again. I followed everything to a tee. Just did half the amount of mushroom and veggies. this was sooo good. the sauce is $$$$$. definitely will be making again. I made this recipe along with the recipe for cauliflower rice as the base & it was so delicious! Doubled up the recipe for the marinade because of the other comments & it was enough for 3 LARGE servings. Will definitely make this one again, lovely flavour profile savoury, sweet, spicy & the portobello mushrooms were so tasty. Yay! We are glad to hear you enjoyed this recipe, Daena! I substituted fresh spinach for the broccoli, love how simple it was. Glad to hear you enjoyed it, Chris! I made this and it was very tasty but definitely needs to be doubled up. Fortunately hubby was working outside when I made it so I scarfed the whole thing down and cleaned up as if nothing happened. I’m sure the house has wonderful smells from the mushroom marinade so I’ll be busted once he comes in. Oh well I can easily remake it. Very tasty and once mushrooms are marinated, it’s very quick to make. I mean – very quick!!!! Thanks for posting this delicious dish. I look forward to trying it for myself! Just thought I would point out a minor typo in the nutritional facts. Surely the amount of sodium is 1040 mg, and not the listed 1040 g (a kilogram, in fact, haha!). No intention of being pedantic, just figured the clarity would help out those members looking for precise nutrition facts. Thanks again for the recipes, as they are always appreciated. Thanks for pointing that out, J! I made this with baby portobellos, onions, bell peppers and green onion. It was excellent! Probably the best stir fry I’ve made. I cooked everything until the sauce was thick and coated all the veggies nicely and we ate it with creamy avocados. My kids loved it as well – true testament to how good this recipe is! I used baby portabellas, brocolli along with some onions as we were on vacation and had limited availability of ingredients. It was lovely. One of the better stir fries I’ve made. I loved the flavour of this recipe! I had left over snap peas and leek and sautéed them in place of the broccolini and it was delicious. I will certainly make this many times as the marinade is quite lovely-the perfect combination of sweet and spice!! (I didn’t add the sesame oil as I like to dry saute). Oh boy did we love this. Definitely making this again. And again. And again. It was so delicious! I will definitely be making this again and again. Very tasty marinade. I love your recipes! Just made this tonight and it was so delicious!!! This marinade is so fire, I will certainly be saving that for later! I am not even the “cook” in the house and my boyfriend said this was a recipe to keep!!! Thank you Dana!! Dana – I have a question about the new plant based 31 day meal ebook. Would you please tell me the fat content of the majority of the recipes? I have enjoyed making many of your recipes and plan to make this stir fry tonight. Could I sub the red pepper flakes with garlic chili sauce? Hi Laura! That sounds tasty! I was looking for a recipe because I purchased Portobella mushrooms on impulse at Trader Joes. I will make this tomorrow and let you know how it turned out. Thank you for the recipe. Made this tonight and it was deliscious! I will definitely be making it again but next time I will double the marinade to have extra to toss over the final dish. New to the vegan space and came across this recipe. I have to say this was yummy..with 1 substitution.. used cauliflower rice to reduce the carbs. My husband who’s pretty picky loved this and said it was a keeper! Thanks for sharing this great recipe for newbies like us. Made this tonight and everyone loved it! I subbed kale and spinach for broccolini. Will definitely make this again! Thanks for sharing!! I am a sixty eight year old lady who is three weeks into a plant base lifestyle. Made this dish tonite I thought I died and went to heaven. This is by far the best recipe I have tried in the last three weeks. So easy and so good. This was easy and flavorful. I will make again. I just made this for dinner tonight. This is the first one of your recipes I tried. What a winner! We loved it. I only had cremini mushrooms, but it was fantastic. Looking forward tomorrow night’s dinner of leftovers. Thanks! Just made this for dinner… SO GOOD! 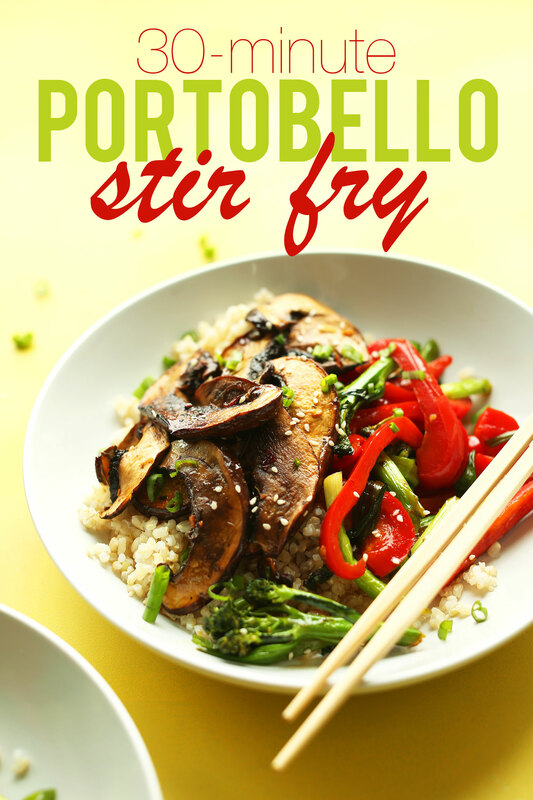 I used broccoli, peas, and peppers as my vegetables… The portobellos are so flavourful! This recipe made me love Portebellos! It’s amazing! 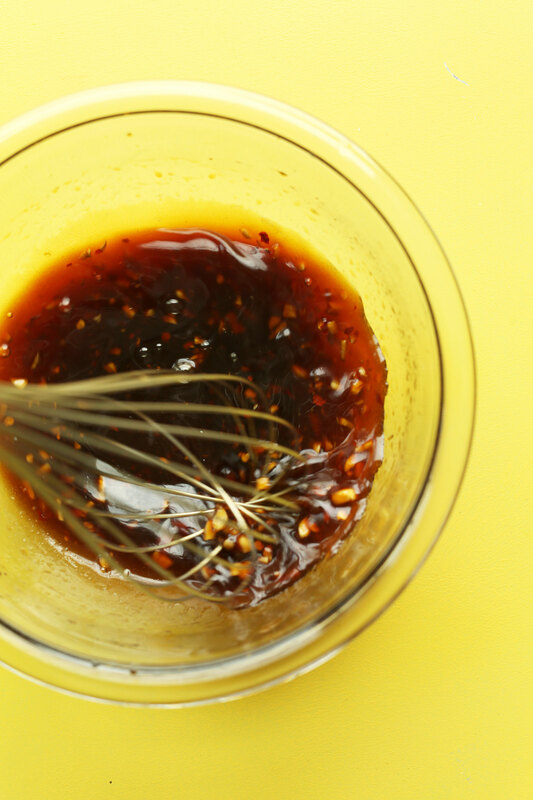 This marinade (and recipe!) is absolutely delicious. Thanks! Absolutely delicious!!! The portobellos were sooooo tasty! I’ll definitely be making again. Thank you. VERY delicious, easy, and flavorful. I followed the recipe exactly with additions of brown rice, green onion, sesame seeds, and a little Sriracha. Used 2 portobellos…. next time we may double at husband’s request. Thank you (again) for an awesome recipe! Tried it today. Very tasty marinade. Will definitely be making it again. This marinade/sauce is killer! I took it easy on the red pepper flakes because I have a 2 year old, but we gobbled this up. I’m putting this into our recipe rotation. Thanks Dana! Really good–I used regular onions since I didn’ have green, and zucchini instead of broccoli. Really good making this again tonight with cauliflower rice ! I love this recipe and I love this website! I made this for dinner and wow it’s good! I used portobellos, broccoli, spinach and green onions because that’s all I had in the fridge. I also ran out of soy sauce (the horror!) so I mixed a little miso paste with water to make up for it. I will be using this marinade on Gardein chick’n too. Next time I’ll definitely have peppers and enough soy sauce on hand. Thank you for getting me out of my teriyaki rut! Thank you for the recipe, I just made it and it was phenomenal!!! Simply AMAZING!! I am cooking weekly for my family. Dana I believe we are soul sisters with our love for food but thanks to you I am finding a love of new foods becoming a vegan. THANK YOU for sharing your passion!! The world is a better place. ? Delicious and thank you. My only question is, what happened to the stems? want to make this dish, but the sodium is so high; how can this be healthy. I am on blood pressure medicine and have been trying vegan dishes; many have high sugar contents or high sodium. Could I use coconut aminos instead of soysauce or tamari? This was awesome. I’m amazed how the portobellos absorb that liquid and really give the whole dish an amazing flavor. I was skeptical when there wasn’t a sauce but I was totally wrong. I made mine with regular broccoli as I didn’t have any broccolini on hand and worked just fine. I definitely added the marinade as directed while sautéing the vegetables and it all turned out great…over brown rice. Thanks so much for the recipe and your blog. Very appreciated. This is so good! The sauce is amazing. I omitted the fresh ginger because my husband doesn’t like it (!!!!) and instead snuck in a little powdered ginger. I also cut the red pepper flakes back to 1/2 tsp. because I’m a wimp about spicy food. Seriously delicious and beautiful, too. This marinade was delish on portobellos! Thank you for sharing! I used onion, spinach and carrots as my veggies and served it over garlic brown rice & quinoa. This recipe is amazing. The marinade was really flavorful. I used 1.5 large mushrooms (~60g each). I want to try this marinade on some tufu as well. Thanks again, Minimalist baker — another one out of the park! SO delicious and SO easy!! A new go-to for our family. I just made this – specifically with the marinade and mushrooms – with some left over veggies. I didn’t have red pepper flakes, I used cayenne pepper. delicious!! the marinade was amazing! thank you for posting. will definitely be a repeat meal! Ohmygoodnessthisstirfry! My local Wegmans only had broccoletti (which I had never heard of but it looked similar enough to broccolini?). Even though I tend to not repeat recipes often, at least in a given month, this was so tasty I made it again the next week! I added some snow peas and next time I might try water chestnuts too. The recipe was good overall. It definitely tasted very fresh thanks to all the veggies. I substituted the broccolini for broccoli due to the cost of broccolini. I did, however, have some problems with the sauce. I think maybe I just don’t have a taste for ginger. Everytime I try a recipe that has ginger as a component, I end up slightly disappointed. I would make this again but without ginger. P.s. I also can’t wait to make the simple vanilla cupcakes from your cookbook to share with my elementary school aged students for their end of the year treat! This was so good. I made this this morning and took to work for lunch. Lovely! thanks for sharing, Mavis! This was my first time to try one of your recipe’s. It was just wonderful. I made it for my grand daughter because she is vegan. When I told her I got the recipe from the Minimalistbaker she said that is my favorite one to use! So we were all happy! Thank you! This looks delicious, and I’m making it tonight! I’m pretty new to your website, but I’ve tried a couple recipes and they have been great!!! 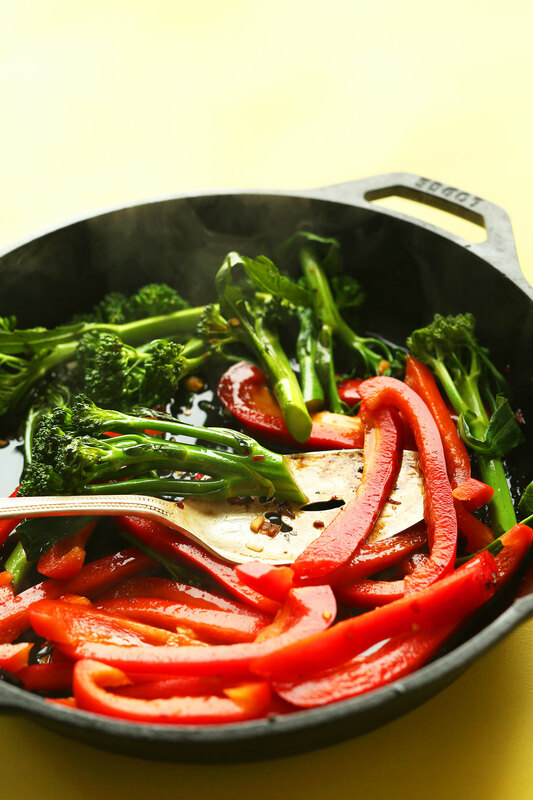 I have a general question – I noticed that you use a cast iron skillet for many of your recipes. What size skillet is shown in the photos, and can you give any tips on using cast iron? I have always been kind of “afraid” of this. How do you keep it from rusting? Is it “safe” (I’m thinking leaching of metals and lead, but I don’t recall where I got that in my head). Hi Rosie! Mine is a 10-inch, I believe. Cast irons are actually healthy to cook on, especially for vegetarians and vegans because your body absorbs some of the iron! A great brand is Lodge. Good luck! This is an outstanding and fantabulous recipe and I really enjoyed it while reading it.. I am one of the renowned Corporate Caterers in Mumbai and I am really amazed by what you have done it for me.. I love the idea of stir fry, but it always seemed to be so boring for my family if I didn’t put any meat inside it. This one looks so lovely and colourful though! I must definitely try it out asap! made this for dinner tonight and my boyfriend and i both loved it! so simple and yummy! i actually marinated the mushrooms overnight because i meant to make it yesterday (oops) but they were definitely the best part…for the other veggies i cleaned out the fridge and used green pepper, celery, broccoli and red onion. thanks for the great recipe! Lol, I just made a very similar recipe for dinner yesterday and this morning saw your recipe: I used mushrooms, peppers, onion and would have wanted to add broccoli and we were out of it. I made a peanut butter, satay sauce for my stir-fry, and I agree, it tastes great with brown rice! ps: Your cookbook was finally delivered yesterday, it looks fantastic! Can’t wait to try the recipes! So great! Hope you love it, Stella! Perfect dish when you want to eat something very good and tasty and without meat:) Thank you for sharing! Ooh la laaaaaaaa! 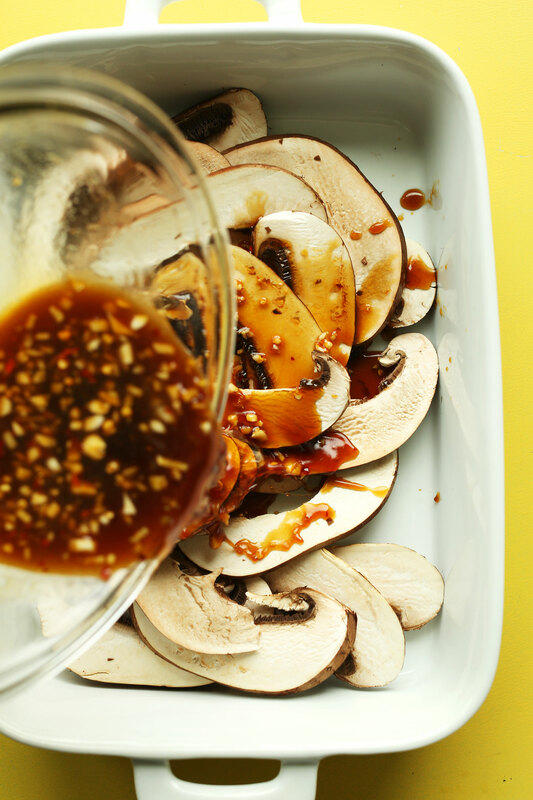 Mushrooms in a stir-fry sauce are basically heaven that can be made in a quick amount of time and in such an easy manner! White mushrooms are my favorite vegetables to put in a stir-fry for dinner! This recipe was perfect for today because I had portobello mushrooms in my fridge calling out to me. Admittedly, I didn’t follow the recipe to a T, but I did follow the marinade recipe (and later used it as a sauce) and it was delicious!! Lovely! Glad you liked it. Thanks for sharing! This looks really good. I love Portobello Mushrooms. Who need´s meat when you have mushrooms?! Maybe i try it with Mie noodles. I love how that board makes those Portobello’s look HUUUUGEEE!!! So heavenly! I love the simplicity of the dish! The perfect entree for the summer! Love the yellow backdrop in these pictures! Yep. Mushrooms are super tasty and beefy for beefy guys like me who like a little bulk to their food minus the calories. So this stir fry looks amazing. I’m a gym teacher! I need some energy so I can beat my students at ping pong. Delicious and next time doubling the marinade for steak, chicken etc. So easy!